Author of the preeminent biography of Deng Xiaoping, Deng Xiaoping and the Transformation of China, Ezra Vogel agreed to draw comparisons with Xi Jinping. We presented widely shared impressions of Xi and asked Vogel to assess the similarities and differences from Deng. EDITORIAL STAFF: Xi Jinping is often compared to Deng Xiaoping as a vigorous, transformative leader. Deng altered the course of China left by Mao Zedong and set it on the path to become a modernized, powerful actor in global affairs second only to the United States and capable of challenging US power. The rise to power of Deng and Xi was strikingly different. What comparisons stand out in your mind in their background for leadership and style of governance? EZRA VOGEL: First, the level of experience of the two leaders differed greatly. Deng was familiar with the outside world after five years of living in France and also one year in the Soviet Union, as well as many meetings with foreign leaders. Given Zhou Enlai’s incapacitation in 1973-1975, Deng was running China’s foreign relations. During the period 1956-1965, he managed China’s bureaucracy, developing a vast network of connections to officials in Beijing and beyond. He knew how things worked in the Party Central, and he was welcomed back as the leader by many who had been desperately awaiting some return to orderly governance. He was well prepared to assume power. In contrast, Xi’s career was in local areas, not in Beijing, and he had virtually no experience in foreign countries and in meeting foreign leaders. As part of a generation sent to the countryside and cut off during the long period of the Cultural Revolution, Xi had little experience with the Beijing bureaucracy or with foreigners. He lacked close ties with key top officials. His two-year stint in the People’s Liberation Army (PLA) pales in comparison with Deng’s twelve years as political commissar in the war against Japan, culminating as political commissar of the Second Field Army and as political commissar over half a million troops in the decisive Huai Hai Command. During the Cultural Revolution, Deng had three and a half years to reflect on what he had learned from his time in power and to contemplate what China needed. Xi’s work experience and background as a regional leader did not provide him with the range of experience or the opportunity for quiet reflection on how to govern the country. Second, the condition of China when each took power was strikingly different. Deng needed a totally new approach in the face of chaos and the disastrous failures of the Great Leap Forward and the Cultural Revolution. Xi inherited a strong country whose modernization was far along, having opened its economy to the outside world following market principles. He could turn his attention to new ways to control some things gone badly, such as corruption, working within China’s established structure. Deng had to establish a new order, forging ties to the outside world and radically changing the underlying structure of China’s domestic system to make way for a market economy open to the influences of the outside world. Thus, the two leaders faced the world from very different starting points. Deng chose to “lie low,” establishing good relations with all other countries in order for China to regain its footing. Xi led a confident China, emboldened by its own modernization and by the financial crisis in the West as well as a rapidly strengthening military. Third, Deng and Xi had different styles of governance. Deng did not need a formal title. He had a range of high positions, including a decade as general secretary of the Party; he had led China in the revolutionary period. He had worked closely with Mao and Zhou Enlai and was the obvious heir apparent. His low-key approach meant that he delegated power to those he knew. Xi needed to boost his own stature with official titles and create a formal structure to take hold of diverse lines of control. As a micromanager, he makes all the final decisions himself on key matters. Deng read reports in detail, providing broad oversight and guiding the introduction of key policies, while relying on other officials to manage operations. In all of the above respects, there are striking differences. Deng was a strategist, who was not afraid to delegate authority. While he gave free reign to forces previously left with little initiative—decentralization to markets, local areas, and etc.—, he also was a centralizer, establishing supervision after the chaos of the Cultural Revolution. Xi also has sought to increase supervision, imposing a more centralized structure of power, but he is finding it more difficult to implement his agenda. Yet, prevailing images of his power are overstated. He actually is not as strong a leader as Deng, in my judgment, because he does not have the accumulated experience in managing the centralized bureaucracy, the unquestioned authority based on decades of leadership, and the sure hand as an experienced policy manager at the top of the party and state. EDITORIAL STAFF: Xi Jinping’s foreign policy has drawn rave comments from many as assertively putting China in the forefront in Asia, while moving substantially toward a new type of major power relations with the United States. Others criticize it as overreaching, spoiling the goodwill and soft power China had accumulated over more than three decades from the time of Deng Xiaoping. How do you compare Deng’s approach to international relations with Xi’s? EZRA VOGEL: For Deng, good relations with the major powers were of paramount importance. He knew foreign leaders, valued their goodwill, and understood the necessity of establishing close relations in promoting the importing of foreign technology and capital. Deng considered good relations with major foreign countries to be more important than border issues. I do not think that he would have let territorial issues interfere with these priorities. He would, thus, have been less assertive, more careful to prevent estranged relations with other powers, including the United States and Japan. Deng was not prone to bravado. In this respect, Deng’s firm leadership in early 1992 showcased his priority for increasing FDI and wealth. He would, I think, also have been cautious about allowing companies to engage in economic cyber theft and in accelerating military spending in a manner that would arouse distrust. To be sure, Xi inherited a country that was much stronger and more confident than the country that Deng governed. On the eve of Xi’s ascendancy in late 2012, China’s conduct toward the United States and other states at the ASEAN Regional Forum (ARF) meeting reflected a much higher degree of confidence in China’s power than in the years Deng was China’s top ruler. EDITORIAL STAFF: Recently, much has been written about Xi Jinping’s “China Dream,” his views of history, and his reconstruction of Chinese national identity. Reflecting on various dimensions of identity, how do you assess Deng’s thinking about what makes China unique or superior? EZRA VOGEL: Ideology. For Deng, this was not a high priority. He had watched for decades as it was used as an excuse for interfering with pragmatic policy making. Moreover, he had long disagreed with officials who looked to the Soviet Union as a fountainhead of ideological orthodoxy or a model. In 1979, he set forth the “four cardinal principles” where he established his bottom line (leadership by the Communist Party, Maoism, Marxist-Leninism, and dictatorship by the proletariat) as a bulwark against ideological disorder. When more discipline appeared necessary, he did not stand in the way of campaigns of an ideological nature in the 1980s, but he took little interest in ideological debates. In the 1980s, reemphasis on ideology raised alarm that the result would be pressure to halt market-oriented reforms and measures to open China wider to countries with the most advanced economies and technologies. As long as ideology was used in more limited ways deemed beneficial to social order, Deng could lend his support. If Mao had been determined to eradicate symbols of Confucianism and Xi proved tolerant of reincorporating some of them into an ideological amalgam, Deng placed little importance on this potential element of ideology. Even before 1949, some Chinese blamed Confucian traditions for the troubles that led away from convergence with the West. Others believed that they provided a legacy in China that helped bring modernization. Deng saw no reason to blame China’s slow modernization on Confucianism and was too much influenced by the May Fourth Movement in his youth to expect that China’s salvation required a revival of Confucian themes. Deng wanted China to learn from Western thought as well as Western material successes. On another aspect of ideological identity, anti-imperialism, Deng saw little need to play this card, which could provoke Japan and Western countries. In contrast to his successors, beginning with Jiang Zemin, he did not rally Chinese behind this cause. Textbooks and other publications continued to voice anti-imperialist narratives; Deng did not intervene to uproot this legacy. In this respect too, Deng was less committed to any particular ideology and more concerned about what would work to maintain discipline and keep public support. History. Another dimension of national identity is history, including claims of pride or superiority about premodern history. These became pronounced toward the end of Hu Jintao’s tenure as China’s leader and have been emphasized even more under Xi Jinping. Deng was less concerned with history. Unlike recent glorification of the tribute system and even swagger about the “harmonious world” China forged in its benevolent outreach to Asian neighbors, Deng came from the generation who had striven to throw off the backwardness that left China defenseless against the West and Japan, and ready to seek lessons from the West. Deng was concerned about retaking Hong Kong and Taiwan to overcome the century of “humiliation,” but less concerned about other territorial claims. He avoided arousing passions against the West or Japan centered on history. He had fought against the Japanese, but he focused on what was needed for cooperation with countries of the world, including Japan, that China had fought against in WWII, and other countries that Chinese volunteers fought against in the Korean War. Xi did not stop the large numbers of movies and TV shows that featured the fights against the barbarous Japanese. As showcased at the September 3, 2015 commemoration of the end of the war, Xi was more willing than Deng to remind the Chinese public of the Japanese horrors during World War II. The history of the Cold War remained ongoing until 1989, as China continued to see little value in revising its judgments about the Soviet transgressions that had no less prominence than those of the United States until the early 1970s and more so over the following years. Deng resented Soviet treatment of China from the late 1950s and showed little interest in meeting Soviets even after the policy of openness was proclaimed in 1978. Deng’s decision to go to war with Vietnam in early 1979 was sparked by the view that the Soviet Union, with the cooperation of the Vietnamese, was encircling China. When Gorbachev came in 1989 to heal the breach between China and the Soviet Union, it was on Deng’s terms. To be sure, many high officials in China, especially those who studied in the Soviet Union in the 1950s, thought differently and sought a more positive assessment of Soviet history and were even opposed to the war against the Soviet ally Vietnam in 1979. More recently, under Xi, historical national identity has been reconstructed in the struggle to draw a firmer line supporting Chinese claims in the South China Sea and the extension of Chinese influence around the world, sometimes at the expense of American influence. Deng took pride in the history of the Chinese people, but he accepted the Enlightenment in the West as the shared starting point for modernity and was prepared to narrow the differences with capitalist countries. He anticipated a long period ahead until the mid-twenty-first century of catching up as part of an international community and not challenging that order. Nationalism was part of his agenda, but he wanted modernization and believed this required maintaining good relationships with the major countries of the world. Sectoral Identity: Political, Economic, and Cultural. Deng believed that unified leadership under the Communist Party was the right system for China, but he believed that reforms were needed to make the system more effective. He was willing to allow Zhao Ziyang and others to guide the introduction of fundamental changes in the economic system. Although he took pride in Chinese civilization, he was willing to open the door to the introduction of culture from abroad, which he believed could enrich the country. He was even willing to introduce Japanese culture, including Japanese movies, TV programs, music, and youth culture, feeling it could enrich Chinese cultural life, pave the way for better relations between Japan and its neighbor, and make it easier for Japanese technology and organizational patterns to assist in the modernization of China. Deng believed that it was important for the Communist Party to guide the introduction of new cultural products from the West so as to maintain order, but he did not repeat the claims of the Maoist era of China as a model for others. Deng was an instinctive patriot, who believed in the people of China and its past successes and the successes of the Communist Party in unifying a vast country and beginning the process of modernization. But he believed that Chinese culture needed to adapt to a new era and that China had much to learn about best practices from around the world. He tried to avoid provoking those who had accepted the ideology of the Maoist era, but when he said that it does not matter if the cat is black or white as long as it catches the mouse he made it clear that China no longer needed to adhere rigidly to the ideology of the Maoist era. He believed that organizations required discipline and that society needed rules and order, but he believed that leaders should be pragmatic; they should “seek the true way from facts.” In a country as large as China, Deng was ready for local areas to try a variety of experiments to find what worked, and if something worked in one area, he would encourage others to study and learn from those successes. Deng believed it important for those in higher positions to learn what was occurring at lower levels and to listen to other views, but he did not believe that Western patterns of democracy were appropriate, and he feared them being used to break down the efforts to maintain order. Having served for 12 years in the PLA, he had a more hierarchical notion of discipline and believed in “democratic centralism,” getting ideas from lower levels but then having strong leadership from the top and obedience from lower levels. He believed that the Communist Party leadership and organization was strong enough to keep order even with the disruptive introduction of competitive markets, including the introduction of foreign businesses. Deng’s handling of Mao sought to preserve the aura of authority in the Communist Party, but said that Mao’s comments at any one time were not necessarily applicable at another time. They needed to be understood in context and in line with the overall purposes. He stated that China should follow the essence of Maoism, which was “to seek the true way from facts.” He also acknowledged that Mao should be judged 70 percent correct, which is very good for any leader. He acknowledged that Mao made errors in his later years, but those errors were the errors of “all of us,” not Mao alone. As a hero in the anti-Japanese war, Deng had the political confidence to encourage better relations between Japan and China. He wanted China to take a low posture in international affairs and never to seek to become a hegemon. Xi Jinping has been willing to allow a higher level of anti-Japanese mood, focusing on the history of Japanese aggression. He has been more willing to support the assertion of Chinese territorial claims in the South China Sea and the East China Sea. Xi has allowed more attention to China’s historical humiliation than Deng did, linking it to assertions that other states are trying to contain China. Deng was impressed with the wisdom of Lee Kuan-yew and various Hong Kong businessmen about positively respecting Chinese, tradition while acting vigorously and not defensively to embrace the international community. Deng was removed from decision making in 1989-1991 when a conservative backlash placed constraints on market forces, but in 1992, at age 87, he made a vigorous assertion of the importance of openness to market forces. Xi has allowed Chinese media to take a more critical stance toward Japan and the United States. 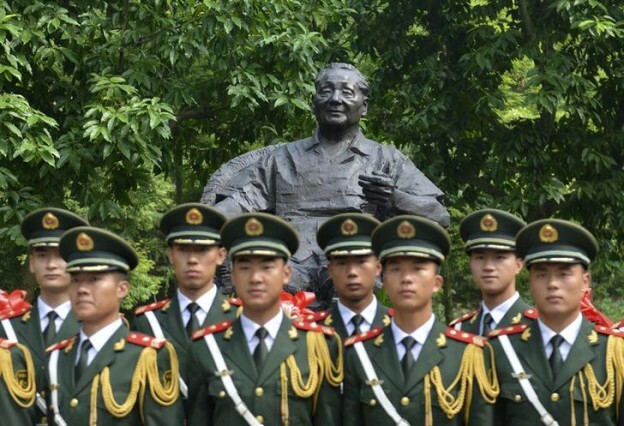 It is unlikely, if Deng were still alive, that he would have supported such assertiveness.. Deng was more committed to learning from these countries, maintaining good ties to them, and not championing ideology or national identity in a manner that would cause others to be wary of China’s intentions. A good start in making comparisons of this level backed by the intimate knowledge of a worthy China hand, Ezra Vogel. But I would think that the contexts are so different and times have moved forward so Deng and Xi have to deal with different realities facing the vast country. China’s size and the full complexity of its social, cultural, and political economy needs will demand a highly skilled thinker. Mao, Zhou, Zhu, Deng and their comrades led China out of the most utter misery, foreign aggression and abject poverty and many, many Chinese lives were sacrificed. Before Deng, there were already many forward thinking Chinese hindered by the Qing elite to modernise China. In this context, one should appreciate that like everything else, there is a continual progression towards modernising China and there’s still much more to do in a country and population of its sheer size.Xi is thrusted on to the world stage at a very spiralling time of needing a variety of economic controls and measures. I was in China for a short year and it showed on CCTV how the Chinese political structure works so it appears to me that whilst there is a head of state representation, the Chinese political figures work mainly as a team. Whilst in the larger assembly of state representations, some might sleep over the lengthy speeches of others, or fill their thermos to keep awake, there is a kind of filtration so that the worthy privy council that heads the main ministries, are all worthy, alert and absolutely competent to discuss with Xi how China should move forward. I personally would just like to watch the way their infrastructure is progressing – making solid EU bins that have durable lids along most streets all over the country, organised collection of rubbish, ensuring sufficient water facilities and availability, efficient and cheap transport, adequate toilet facilities well maintained, modern new townships with abundance of shops, trees, new roads… all the fabrics of the Chinese dream a government can build… as I see it, China can benefit from Singapore, the UK and the world e.g. France, Russia, Germany and the Netherlands, with setting up more efficient engineering projects. They have already nearly completer the much required giant dam which will channel much needed water uphill to the north where the desert is encroaching, the miles of HS rail (which is one of their best achievement) that opens up China to the Chinese and travellers… I believe Xi is putting his house in good order. Relations with most countries is good and mutually beneficial… but there’s always more to cover in this area and China has been bitten too many times, even in the post Deng era, of having to deal with unscrupulous traders and they know who they were… there much more to say,,, of which one’s pleased with the good Russia-China , China- Africa and emerging countries mutually beneficial ties… and with the numbers of Americans working or travelling China, I hope we’ll see improved relations between US and China. They have to lead the world out of their current slump; but let each country begin to build their own dreams for their own citizens and from there reach out to help each other get to Swizerland, Netherlands or Singapore. The entire reason that Deng permitted the reform and opening up was, as he said, “Otherwise, China will be bullied”. China has been bullied nonetheless (the deliberate bombing of its Belgrade Embassy, the Yinhe incident, Tibet incursions, etc.) but the degree of harm it has suffered would no doubt have been greater had Deng not accelerated the country’s development. He was not assertive during his lifetime precisely because he did not have the means to be assertive. Xi does. I expect he will assert China’s rights by sinking any US Navy vessel entering Chinese waters. China has paid a great price to get to this point and the Chinese would be greatly disappointed if Xi does not spend some of Deng’s legacy on standing up to further bullying. Xi grew up around people who ordered generals around, one of whom was his father. He has no problem dealing with power. The US Navy is well prepared for a maritime confrontation. I doubt if they’ll get it. More likely, the Chinese will launch ASBMs from shore, probably armed with non-explosive warheads. The effect of 500 lbs. of solid tungsten striking a ship vertically at 7,000 mph. should be enough to get the message across. I have yet to hear a plausible US response scenario if such an attack were launched – other than the immediate crashing of the world economy and/or a nuclear war. Perhaps Forum readers can provide some.